KT: Yeah…so you can run over it! Don’t worry, he’s very good at staying on designated trails and not tearing up the unsullied nature that we really do love. That totally looks like fun! I miss my pathfinder – that thing would go anywhere. I wonder if I could drive my car though that? Probably not. Looks like fun though. Messy and fun.. great shot! That sounds fun. 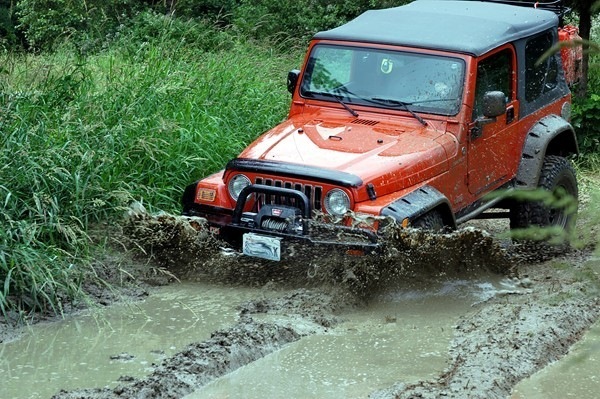 Some muddin’! Can I come? I need some mud for our Jeep! Lisa~Yep, so will this thing! Hilary~notice how I’m on the outside of the jeep? Jennifer~I don’t do well as a passenger…I think it’s a lack of control thing. That is too funny. I wouldn’t want to be the one who had to clean that up though.